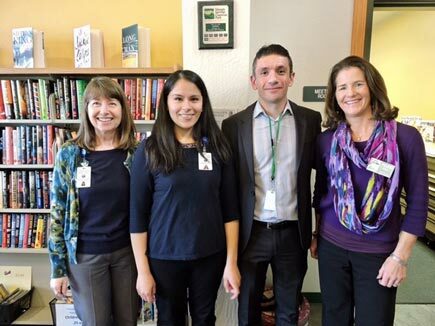 Families, community members, and local dignitaries came out to support the official opening of Community Hubs, an innovative and collaborative project in El Dorado County that is connecting parents to resources and building strong, resilient families. Ribbon Cutting events took place during February 2018, at each of the five Community Hubs located throughout the county to recognize and celebrate the Hubs and their Teams. Each of the Ribbon Cutting events included a warm welcome from Library Director, Jeanne Amos, the reading of a Board Proclamation from a District Supervisor that demonstrates the County’s commitment to the Community Hubs project, and an introduction of the Community Hub Team members. The celebrations finished off with dozens of moms, dads, grandparents, caregivers, and children joining the weekly story time -- one of many activities for families with children birth through 18 years of age at the Community Hubs. There are five Community Hubs, serving families in each of the County’s supervisorial districts and surrounding areas of El Dorado Hills, Cameron Park, Placerville, Georgetown and South Lake Tahoe. Each Community Hub is staffed by a team of caring and professional family engagement, literacy and health specialists. Hubs offer classes, groups, and activities for expectant parents and families with children ages 0-18. Families can find weekly story times, playgroups, parenting tools, and workshops, health and developmental screenings, referrals to community resources and more, all at no cost to the families. 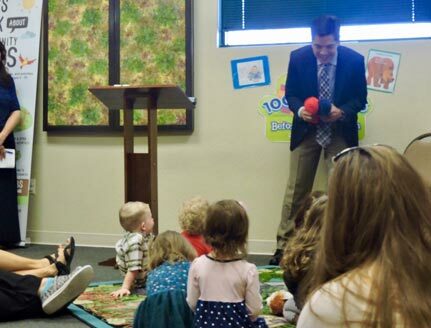 Dr. Ed Manansala, County Superintendent of Schools, shows the young onlookers his juggling skills. Community Hubs are a collaborative partnership between the El Dorado County Library, El Dorado County Health and Human Services Agency’s Maternal Child and Adolescent Health Program and Mental Health Services Act Program, the El Dorado County Office of Education’s Early Care and Education Planning Council and Child Abuse Prevention Council, and the First 5 El Dorado Commission. For more information about the Community Hubs.